Saturday was the day the Ku Klux Klan was coming to Memphis to protest the city’s decision to rename three Confederate-named parks including one that honored the founder of the Ku Klux Klan Nathan Bedford Forrest. Because the last Klan rally in Memphis back in 1998 had ended in tear gas, vandalism and violence, a number of community groups organized an alternative event called Heart of Memphis at Tiger Lane near the Liberty Bowl, with food trucks, live music, events for the kids and workshops. Unfortunately, the same rains that disrupted the Klan rally downtown also made a washout of the Heart of Memphis event. The music stage had to be moved indoors, and attendance was hindered by the weather. But workshops were held, including the Peoples’ Conference on Race and Equality sponsored by the Mid-South Peace and Justice Center, which had my friend Dr. Coby Smith as a panelist, and Mayor Wharton briefly spoke. My friends from the I Am Memphis clothing line were also there, as were the good folks from Rock N Dough Pizza. This beautiful riverfront walkery in New Orleans is called the Moon Walk, not because of lovely lunar vistas over the river at night as one might think, but rather in honor of “Moon” Landrieu, New Orleans’ beloved mayor of the early 1970’s, who was in many ways the first mayor to envision a New Orleans free from racism and segregation. 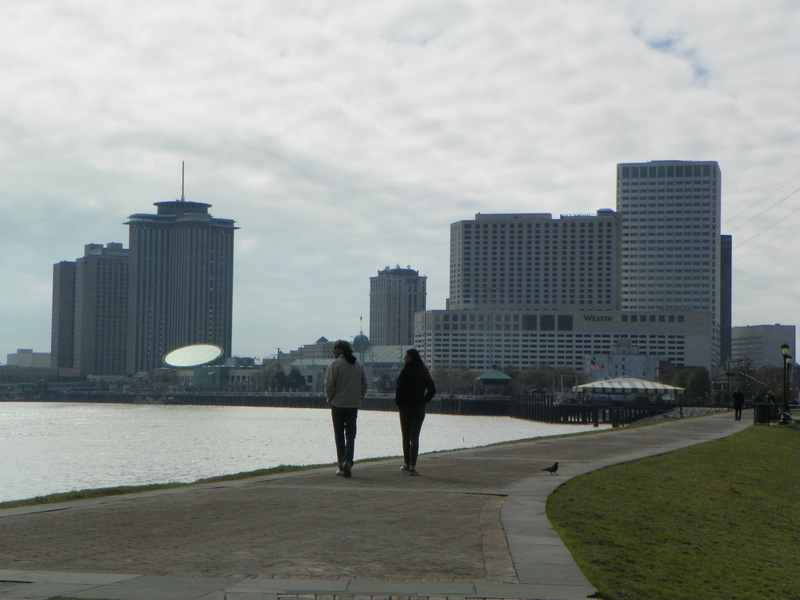 If Landrieu’s first great passion was ending New Orleans’ shameful legacy of racism, his second was redevelopment of the city’s waterfront, and it is for this reason that the name Moon Walk is very appropriate indeed. The Sunflower festival’s decision to enclose a compound directly in front of the main stage for paying attendees opened old wounds related to issues of class and race in Clarksdale, as evidenced by graffiti left on the wall by festival-goers and local residents. One writer cleverly compares it to the Berlin Wall with Ronald Reagan’s famous words to Gorbachev “Mr. President, tear down this wall!” Given the fact that the area was almost completely empty while I was there other than festival staff and security, one can hope that this monstrosity will be gone next year. Dr. Coby Vernon Smith, noted Memphis activist and educator, is the first African-American student to attend Southwestern University at Memphis, which is today Rhodes College. In the spring of 1967, with Charles Cabbage and John Burrell Smith, he founded an organization called the Black Organizing Project in Memphis. Feeling that the mainstream civil rights movement was primarily geared to integrating the black upper class with white society, BOP took on the task of organizing the ghettos, particularly youth. In the Riverside neighborhood around Carver High School the name BOP was gradually replaced by The Invaders, and it would be this name that was spread by local media and which would be remembered. The Invaders marched for the Memphis sanitation workers in 1968, taught Black history classes in storefronts in North Memphis and South Memphis, marched with hospital strikers, and marched across Arkansas with Lance “Sweet Willie Wine” Watson in 1969. Although the media attempted to consistently link the Invaders to violence and hatred of whites, reporters rarely allowed the Invaders to rebut such charges, or to state what their organization stood for. At a time here in 2011 when the rights of union members and sanitation workers in Memphis are under attack from politicians, it is important for Memphians to remember the lost legacy of The Invaders. More background history on the rather tragic town of Earle, Arkansas. Many Voices was a civil rights newspaper published in West Memphis from 1970-1972, covering events in the East Arkansas delta region. Earle was often mentioned in various issues of the newspaper, as there was always some kind of protest, conflict or boycott going on there. I suppose that’s what led to the downtown of empty and abandoned stores. More background information on the troubles in Earle, Arkansas in 1970 that might have led to the town’s current situation. I also read yesterday that the State Board of Education is threatening to dissolve Earle’s school district because of financial problems, which would force Earle children to ride nearly 40 miles roundtrip a day to attend school in Marion or in Wynne. Based on what I saw in Crawfordsville, I don’t see how dissolving and closing schools does anything positive at all. All it seems to do is destroy towns. Further to the west, Earle, Arkansas is a place of desolation that makes Crawfordsville look positively thriving by comparison. The signs at Earle’s city limits state that almost 3500 people live there, but the downtown has the look of a true ghost town, with long blocks of long-vacant stores and shops, many crumbling beyond repair. Some are floors and vacant lots, a legacy of a mysterious string of arsons back in the 1990’s. Everywhere one looks in Earle, there is gang graffiti- Vice Lords, Gangster Disciples, Crips and Bloods. I can’t really imagine how Earle got this bad, although I recall that the town had racial problems in the 1960’s and 1970’s, and union troubles at a local factory in the 1980’s. That had brought Jesse Jackson (and the national news media) to Earle. But now, as desolate as the downtown area looks, the Southside neighborhood below the railroad tracks looks even worse. Old abandoned motels with their doors torn off and open stand beside ramshackle tenements, project apartments, a handful of churches and the occasional store or restaurant. Young people walk in groups down the streets aimlessly in the summer evening, as there are no recreational opportunities in Earle. That might explain the gang graffiti that literally covers nearly any available wall, and not just gang signs and symbols are painted, but nicknames and streetnames, as if kids were yelling “Look at me! Pay attention to people like us trapped in these forgotten towns.” A woman driving an SUV on Second Street noticed me as I was taking photos of downtown and yelled “Take a picture of me,too!” Around the corner from where I saw her, someone had sprayed graffiti on the wall of a church that read “Holy City”, which wasn’t the name of the church. but I though to myself, there is no way they could have meant Earle, Arkansas. While revival and reconciliation has taken place in Jena and LaSalle Parish, authorities in neighboring Catahoula Parish have been investigating a noose-hanging incident near Jonesville, in which the letters “K.K.K.” were also left under the tree in toilet paper. Law enforcement officials there suggested that the incident was a prank since the community in which the nooses and message were found is predominantly white. Two things come to mind. First, Satan does not like revival, because revival is people turning to Jesus Christ and being saved. When there is true revival in an area, watch out for the devil’s counterattack. But the other, more frightening thought, is that when nooses were hung at Jena High School in August of 2006, authorities there dismissed it as a prank. The tragic effects of that miscalcualtion are now known to everyone in the world, and the reputation of the town of Jena suffered, to some extent unfairly, as a result. Young people in LaSalle Parish, Catahoula Parish, or anywhere else, must be made to understand that hanging nooses in the yards of others, or on public property, is never just a prank, anymore than would be calling a high school and warning that a bomb is there. Catahoula authorities (and parents) need to take this threat seriously, before the young people who hung the nooses escalate to a violent act and Jonesville gets added to Jasper and Jena as towns where racism is alive and well.